*Offers vary by model and are subject to availability. 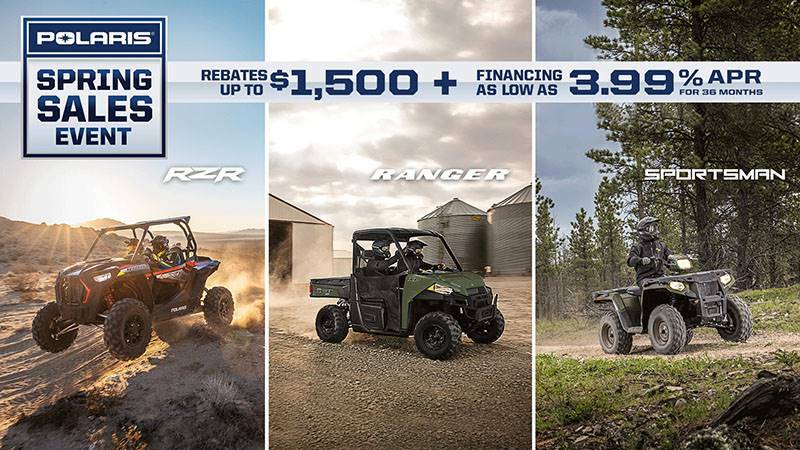 Rebate and financing offers valid on select 2015-2019 new and unregistered Polaris® RZR®, RANGER®, Sportsman®, GENERAL®, and ACE® models purchased between 3/1/19 - 4/30/19, but availability of the offers and the offer terms may vary by State, so please see your local authorized dealer for complete details. †Rates as low as 3.99% APR for 36 months. Examples of monthly payments required over a 36-month term at a 3.99% APR rate: $29.52 per $1,000 financed; and with a 60-month term at a 6.99% APR rate: $19.80 per $1,000 financed. An example of a monthly payment with $0 down, no rebate, an APR of 3.99% APR for 36 months at an MSRP of $12,699 is $374.87/mo. total cost of borrowing of $796.27 with a total obligation of $13,495.27. Down payment may be required. Other financing offers may be available. See your local dealer for details. Minimum Amount Financed $1,500; Maximum Amount Financed $50,000. Other qualifications and restrictions may apply. Financing promotions void where prohibited. Tax, title, license, and registration are separate and may not be financed. Promotion may be modified or discontinued without notice at any time in Polaris’ sole discretion. WARNING: Polaris® off-road vehicles can be hazardous to operate and are not intended for on-road use. Driver must be at least 16 years old with a valid driver’s license to operate. Passengers, if permitted, must be at least 12 years old. All riders should always wear helmets, eye protection, and protective clothing. Always use seat belts and cab nets or doors (as equipped). Never engage in stunt driving, and avoid excessive speeds and sharp turns. Riding and alcohol/drugs don’t mix. All riders should take a safety training course. Call 800-342-3764 for additional information. Check local laws before riding on trails. ©2019 Polaris Industries Inc. Warning: Polaris off-road vehicles can be hazardous to operate and are not intended for on-road use. Driver must be at least 16 years old with a valid driver’s license to operate. Passengers, if permitted, must be at least 12 years old. All riders should always wear helmets, eye protection, and protective clothing. Always use seat belts and cab nets or doors (as equipped). Never engage in stunt driving, and avoid excessive speeds and sharp turns. Riding and alcohol/drugs don’t mix. All riders should take a safety training course.